“Tarangela” is the Spider Woman of the 21st Century. Angela Hale known by her colleagues as “Tarangela” is the real spiderwoman. She has travelled throughout South East Asia in search of the large hairy “creatures of nightmares”. The Tarantula. Her efforts to find, photograph and record new species have taken her to the steamy jungles of Borneo where she travelled deep into the forests armed with only a camera and a flashlight. In 2010 she found , what she believes, is a species of tarantula new to science. Her expedition in 2009 rediscovered the Earth Tiger tarantula hitherto unknown in the area. She hopes that this amazing discovery will help the local people by attracting more eco-tourists to see this amazing “blue” tarantula. Join her has she crosses rivers, climbs trees and finds some of the most weird and wonderful insects and spiders on the planet. This trip is not for the faint hearted though. The jungle teams with dangerous snakes, poisonous scorpions and the ever present tiger leech! She will be returning in 2013. Dare you join her…….? Check out our new Events page to find out where andwhen you can next listen to one of Ray’s fascinating lectures. Ray and his wife Angela have appeared on a number of TV Programmes including “The One Show” and “Michaela’s Animal Road Trip”. They have been guests on Children’s TV in programmes such as “Saturday Disney” and “Prove it” as well as making regular appearances on local TV news channels. In 1999 Angela was the subject of an RDF documentary on tarantulas and both are regularly consulted on spider stories when reported in the media. In 2010 Ray and Angela were involved in the production of a Beginners Guide to Keeping Tarantulas by Australian TV Presenter Della Golding. Take a look at the DVD on Youtube. I’m a Celebrity stars screamed in fear of spiders but Angela Hale doesn’t know what all the fuss is about – she lives with 200 tarantulas in her bedroom. Her semi-detached house in Polegate, near Eastbourne, is home to one of the biggest private collections of the hairy bugs in the world. Postmen approach her home nervously when they deliver the spiders’ favourite takeaway dish. Mrs Hale said: “Tarantulas love eating live crickets and I regularly get a box of 500 of them delivered via mail order. You can hear the crickets rubbing their wings together when they arrive and the postmen often ask what the noise is.” Mrs Hale has been bitten just once in the 25 years she has been housing tarantulas in racks of glass tanks from floor to ceiling in her spare room: “I’d been trying to mate without success so I took the male out of the female’s tank using a plastic container but he leapt out and settled on my wrist. “He sensed my pulse and thought it was a cricket and bit me and then quickly ran up my arm and sat on my head. 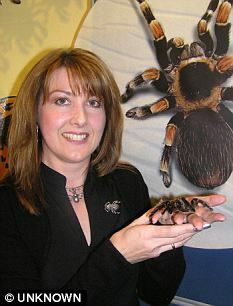 “The poison was painful, like a bee sting, but I treated it successfully with antihistamine.” Mrs Hale is secretary of the British Tarantula Society and helps organise the UK’s largest annual show for spiders in Coseley, near Wolverhampton, known as the Crufts of the spider world.